King Abdul Aziz bin Abdul Rahman Al Saud (known as Ibn Saud), founder of the Kingdom of Saudi Arabia. He was a tall, imposing figure, a natural leader of men. He knew instinctively how to judge men and, as his rule progressed, how best to exploit the natural resources of his country for the benefit of his people. His achievement, the unification of many warring tribes all proud of their own lineage and traditions, laid the foundations for the modern state of Saudi Arabia. His success derived from his faith in Islam and his determination to maintain and build on the traditions of the region. It is the unique combination of faith and respect for tradition, while adapting to the technological developments of modern world, which characterizes the Kingdom of Saudi Arabia today. The judgment of Chambers Biographical Dictionary is very much to the point. It simply states that Ibn Saud “was the outstanding Arab ruler of his time. 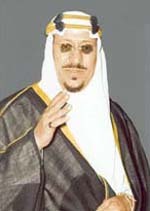 King Saud was the second King of Saudi Arabia, reigning from 1953 to 1964. 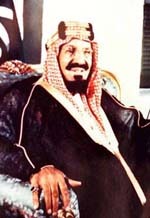 Saud became Crown Prince in 1933 and succeeded to the Saudi throne on the death of his father, King Abdul Aziz (Ibn Saud). In 1953. He established the Council of Ministers and set up the Ministries of Commerce, Education and Health. 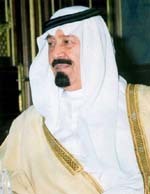 During his reign, the King Saud University was opened in Riyadh. In 1964, Faisal was named regent and, a few months later in the same year, became king. Although a great respecter of tradition, King Faisal proved to be a far-sighted innovator. In the course of his reign, Faisal initiated a number of major economic and social development plans. Under Faisal, the industrial development of the Kingdom began in earnest. In foreign policy, King Faisal showed a resolute commitment to the essential interests of the Arab and Islamic world. 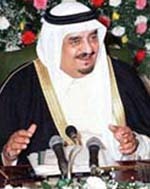 As King, and with Fahd at his side as Crown Prince and Deputy Premier, Khalid achieved much in both domestic and foreign policy, despite a heart condition which would have deterred a less committed individual from such strenuous and stressful activity. Not long after his accession, Khalid launched the second Five Year Plan which set in train much of the infrastructural development on which the future health and prosperity of the Kingdom was to depend. He involved himself in the intractable Lebanese civil war; he convened the historic summit of Arab nations in Taif and the Holy City of Makkah in 1981; and he inaugurated the Gulf Co-operation Council in the same year. For a full biography of King Fahd, his life and achievements, click here to go to the King Fahd web site. King Fahd has brought to his high office a wide range of experience in a number of key posts. 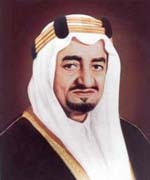 He was appointed the first Saudi Arabian Minister of Education in 1953. He served at that Ministry for five years, laying the foundations for the Kingdom’s ambitious and successful educational program. He became Minister of the Interior in 1962, holding this key position for thirteen years – in the course of which he ensured the Ministry could discharge all its functions as efficiently as any such organization in the world. 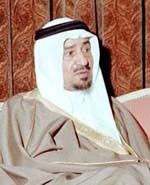 In 1975, when he became Crown Prince, he had, with consummate grasp of the complexities of the task, undertaken the supervision of both the planning and the implementation of the Kingdom’s second and subsequent five year plans.